Wire crochet is challenging, but resulting pieces of uniquely textured jewelry is well worth it. This set includes patterns for a focal piece and two beaded bands that can hold the focal or be worn alone. The focal can also be used as a pendant or for a pair of earrings. This entry was posted on Sunday, August 3rd, 2014 at 10:35 AM by Candace	and is filed under Best Crochet Patterns. You can follow any responses to this entry through the RSS 2.0 feed. You can skip to the end and leave a response. Pinging is currently not allowed. 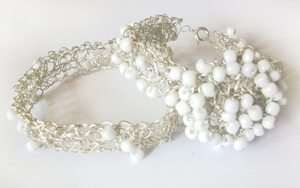 I love to crochet jewelry and, along with hemp, yarn, etc., have worked with wire. The resulting pieces are always commented on, even by strangers, on the bus, the street- even the line at the grocery store!